Last week John Seymour (aka ‘John The Math Guy’) published a very technical, but very good article on color differences and more precisely on 1,0 delta E and a ‘just noticeable difference’. An important topic in the printing industry. As usual, John’s article is very well documented. But when talking about a ‘just noticeable difference,’ there is a hardly known aspect of human observations: the uncertainty principle of visual color evaluations. Which means: you can not be (completely) objective in visual color evaluations if you know that you are evaluating colors. Especially in the packaging world color deviations are considered critical. In a printing company color deviations will be evaluated under a bright light (ISO 3664:2009, ‘critical comparison’: 2000 lux; office lights are usually around 500 lux), to make sure that even the smallest deviations will be visible to the press operator. It is also part of the job description of both the press operator and the print buyer that they can and will detect the smallest color differences. They are paid to find color differences, so they will search for them, until they find them. However, in real life, things are different. In supermarkets the amount of light is (much) less than the 2000 lux in the ’critical comparison’ evaluation conditions, making it (much) harder to see color differences. And in real life people are looking for their favorite product or bargains, they are not looking for color differences. The mindset of consumers is therefore very different. In psychology there is a concept called ‘framing’: when you are directing people – unconsciously – in a certain direction. Just the fact that you tell people, the press operator and the print buyer, that you are looking at color quality, they will be more critical about that color quality. And this should be taken into account, also when doing studies on color. Just the fact that those people participated in a color test and were asked if they could see a difference, directed them towards seeing color differences, even if they weren’t there. And since they saw differences between identical samples, the chances are that also the evaluation of other color differences was overrated. Me: Do you notice anything? She: Euh… you bought two packages of granola bars… Are you hungry? Me: No, that’s not it. Do you notice anything about those two packages? Me: Do you notice a difference between those two packages? She: That one has a dent in it, it is damaged. Me: No, that’s not it. Do you notice anything about the “Golden Syrup” text? Me: Do you notice anything about the color of the background behind the “Golden Syrup” text? Me: No, that’s not it. Do you notice a color difference between that background on the two packages? She: Euh… well, yes, now that you point my attention to it, there seems to be a slight color difference. These are the two packages I showed to my girlfriend. 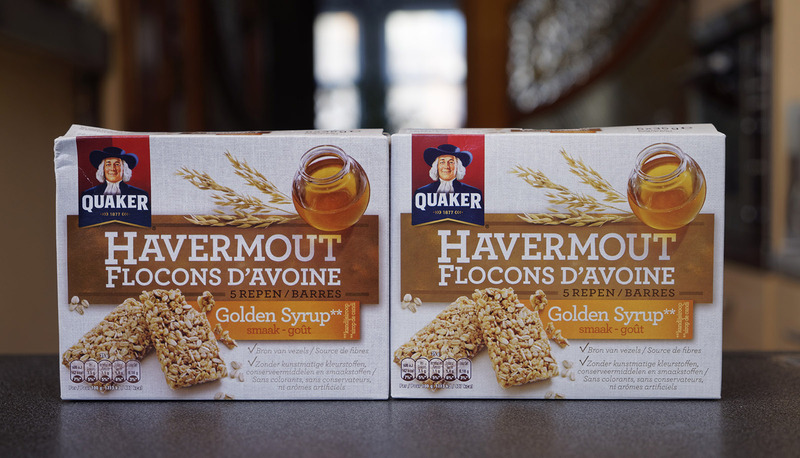 The left one has a dent just left of the Quaker logo. In case you think my girlfriend is either stupid or blind, she is neither. She has a university degree and teaches music and esthetics to 16- to 18-year-olds. But she is more or less an average consumer. One that will first see the damage on a package before noticing a color difference… And one that will only focus on color if you ask her to. 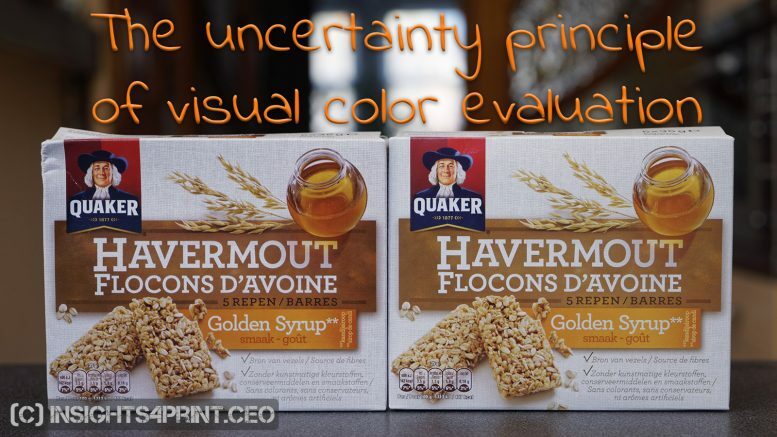 The claim this uncertainty principle of visual color evaluation makes, is backed by scientific research. Over the past few years, I read a number of books on psychology and ‘behavioral economics’. I found cases in these books that are very similar. There are two titles about psychology and behavioral economics I can really recommend: Daniel Kahneman – Thinking, Fast and Slow; Dan Ariely – Predictably Irrational. I hope I’ve made it clear that it’s hard or even impossible to have a really objective visual assessment of color. For quality control, the solution is to measure colors, with a decent and well-maintained device and according to the right procedures. There can be some drawbacks, but it’s at least more consistent and more objective than a visual assessment. For all the color studies that have been executed in the past, it might be wise to check them if they could have been influenced by this uncertainty principle of visual color evaluations. For future studies, a solution might be to observe people, subjects that don’t know that they are part of a color study. This could e.g. be done by putting different packages with slightly different colors on a shelf in a supermarket and see if one color is more frequently picked up by regular customers than another. Or tell participants that they are participating in a different kind of study: e.g. the general design of packages, with design variations which also include slightly different colors. The fact that the topic is ‘design’ might prevent the ‘framing’ on colors. And one more thing: the time available for a visual evaluation should be limited. The longer you look, the higher the chances your brain will tell you there is a difference. The time to detect a color difference might even be a measure of color differences: the longer it takes to detect it, the smaller the difference. But once again the uncertainty principle of visual color evaluations applies: if the subject knows that the measurement is time-based, he/she will ‘see’ color differences faster, making it inaccurate. Let’s think about that. When doing surveys and studies, it is of the utmost importance that the question doesn’t direct the participants into one or another direction. But when evaluating print quality, that’s just what we are doing: we are telling people (e.g. print buyers), that we expect them to search for color differences. Some might stay objective, but (many) others might be triggered to see things that are not there, or overrate them and turn a small, acceptable color difference into a huge issue. And the uncertainty principle should also be taken into account when doing scientific studies… E.g. by adding that extra check to evaluate the objectivity of the participant: evaluating two identical colors. Or telling the participants a different story, that the study is on a different topic. PS: you might also want to check my color memory test. 2 Comments on "The uncertainty principle of visual color evaluations"
Thanks Paul! Another old trick is to first show ‘bad’ sheets, so that the print buyer can make some remarks and after a few bad copies, show a ‘good’ copy, from the pile of sheets that have already been printed. A good press operator/account manager also knows the taste of the print buyer, ‘tweaking’ the print (and the press check process) according to his/her taste.